Many companies have now started showing their presence on the internet. The major reasons why they are moving for web are the less fixed costs, high penetration, easily available, cater online customers, move with the trend, etc. 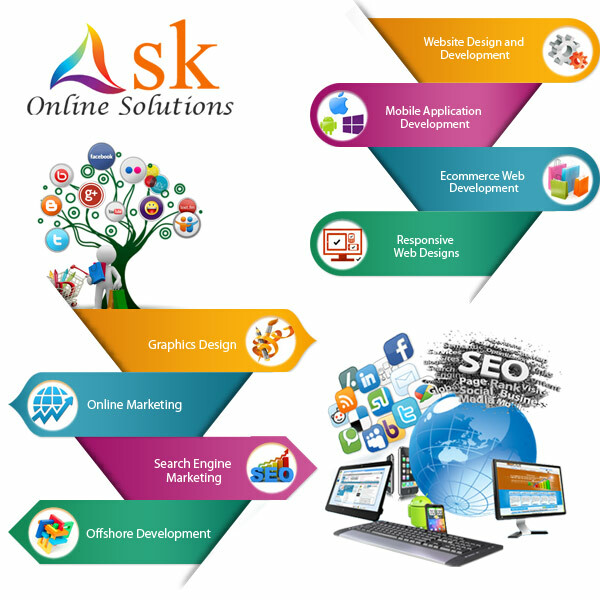 For Web Development, We at Ask Online Solutions cater to all such needs of your esteemed clients and ensure we provide them with complete web development solutions. These solutions are highly customized as per the needs of the clients. Initially we understand the requirements from the client, analyze the requirement and only then do we present a customized product to their web development team. We have a specialized team of Software Engineers, Coders, Designers, Testers, etc. who ensure that they give you the best possible development for your website. Ask Online Solutions Specialize in all sorts of Web Development and we even work on all platforms like the PHP, HTML, CMS Including WordPress, Joomla, Ecommerce including Magento, Woo-commerce, Opencart etc. We also providing Custom based solution with core PHP and Frameworks like Zend, CodeIgniter. We have special teams of all types of coders. In case if your project was being done in one language and now it has got stuck, we help you complete your unfinished web development too and in the language you want irrespective of the existing language. We work along with the technology and hence your coders have hands on experience on the latest software, may it be designing the templates or may it be coding the web pages. We provide different types of Content Management Systems of open source as well as our in house developed CMS to ensure a better web development.